Raging hormones are as old as time, but the techno-culture we live in has complicated things more than just a bit. We live in an image-rich web of interconnectivity in which privacy is a façade and images, information, and relationships move at the speed of electrons. I love rollercoasters. A couple years ago my family and I rode Space Mountain at Disney World and we all loved it. What makes this roller coaster unique is that it is indoors with all kind of lighting effects and visuals that make the ride a whole different experience. At times during the ride it is completely dark, and you cannot see when the next turn or twist is going to take place. Going to Junior High and High School has always been kind of like being on a rollercoaster. It still is, but now the environment has changed so much, it’s like riding in the dark where you don’t know when the next drop off is going to occur. But for our kids, Space Mountain is the only rollercoaster they have ever known, so although we try to talk to them about it, their experience is so different, it is like speaking to someone from a different country. In a very real sense, we as parents need to be missionaries to our kids, entering into their culture and learning their language and sharing the timeless, unchangeable message of Christ with them in ways that they understand. Our goal is not to operate out of a spirit of fear, but a position of strength. Strength in our own walk with God, strength in our relationships with our children, and in turn, their own strength in their desire and resolve to follow Christ. 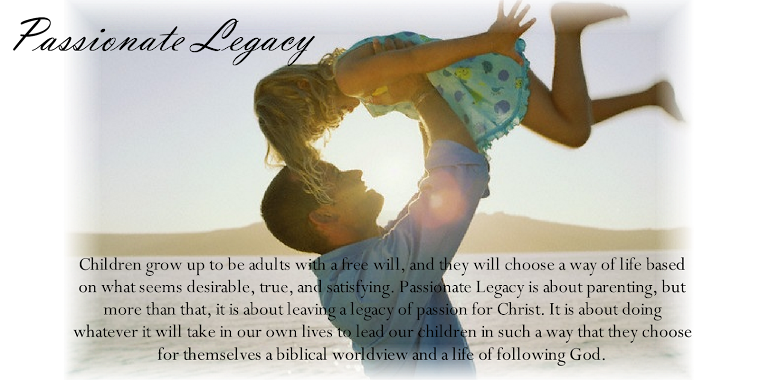 As we re-launch Passionate Legacy, our desire is to create a community where parents can discuss and work together toward the goal of raising kids who are strong enough in their convictions to stand firm, even in the face of the difficult-to-navigate waters of our culture. We are inviting questions, comments and a trading of resources to help in this objective. Please feel free to use the email link on the right to give any feedback. Kids will make their own decisions, they will develop and chose for themselves their own worldview. How they see you and your worldview will affect their choices. Do you have strength in your convictions? How does your worldview affect the way you live your life? Is your way of life desirable, based on truth, and ultimately satisfying? Do your beliefs actually work in the real world? The answers to those questions will influence how much your kids desire to adopt your beliefs and way of life. Resource: Are you wondering about the 12-year-old sending pictures to her boyfriend? Click HERE for the article. Got a question or comment? Would you like to be notified when Passionate Legacy is updated ... Email me here. This site is part of a greater project called Passionate Legacy. It is founded on the concept that effective parenting is an outflow of a passionate relationship with God through His Son, Jesus Christ. Our goal is that parents would be able to instill in their children a passion for Christ by living a life that makes the truth of the Gospel available, attractive and desirable.